The Wisconsin Rapids Recreation Department's mission is to provide a wide variety of year-round recreation programs, facilities, parks and open space and natural areas that respond to the articulated needs and desires of the residents. T-Ball, Pitch Ball, and Spring Activity Registration starts March 1 at 8 a.m.! Spring Activity Guide HERE!! Winter Activity Guide is HERE!! T-Ball/Pitch Ball Registration Packet HERE!! Click here to go to our online registration page! Do you have questions about our recreation programs? Please see below! Non-Residency is any location outside of the Wisconsin Rapids city limits; i.e., Biron, Grand Rapids, Kellner, Nekoosa, Port Edwards, Rudolph, Saratoga, etc. Even if your address is Wisconsin Rapids, you are not considered a resident if you live in a surrounding community. If you have a question about your residency, please give us a call – and thank you for your interest and participation in our programs!! All fees must be paid in FULL at the time of registration. Include payment for total amount of registrations in the form of a check or money order. Registration must be completed prior to scheduled class. You may also register online HERE. Space is limited. Or print our Recreation Registration Form to mail in or drop off with payment. Please watch for a text, or check parks.wirapids.org and the Parks & Recreation Facebook page prior to calling the office regarding cancellation of various activities sponsored by the Parks & Recreation Department due to inclement weather. Classes missed for individual absences (i.e., illness, vacations, etc.) are not “made-up” nor may participants attend classes other than the one they are registered for. Participants assume the risk of injuries that occur during programs and activities. The City of Wisconsin Rapids and the Parks & Recreation Department are not liable for any injuries, or for the treatment of those injuries. Participants are encouraged to obtain their own health or other insurance to cover their participation in these programs and activities. For program promotion purposes, we may photograph several of our activities and their participants. Photographs may be used in various fliers, brochures or on our website. If you do not wish to have your or your child’s photo taken, please notify us when registering. Full Refunds will be given if: 1) Program is cancelled, 2) Attendee gives at least 24 hours’ notice prior to the start of the program, or 3) If there are changes to the original schedule and the participant can no longer attend. No refunds will be issued after the start of the program. Class fees will not be prorated. One of the fundamental instructional program goals is to provide your child with a fun and positive learning opportunity with their peers, while developing separation skills. Parents are welcome to observe the last scheduled class of the session. For the best instructional atmosphere, observation of other class sessions is not permitted. Please feel free to discuss your child’s progress before and after class with the instructor. Our instructors need time to open facilities and prepare for your class. Please provide proper supervision, as children “dropped off” before classes start will not be supervised by our staff. Parents should not leave until instructors have called their class and taken attendance. Classes will end as scheduled. Instructors are either preparing for the next class or closing the facility; your promptness in picking up your child is necessary. Join our active group of volunteers and be a part of a team that can make a difference! 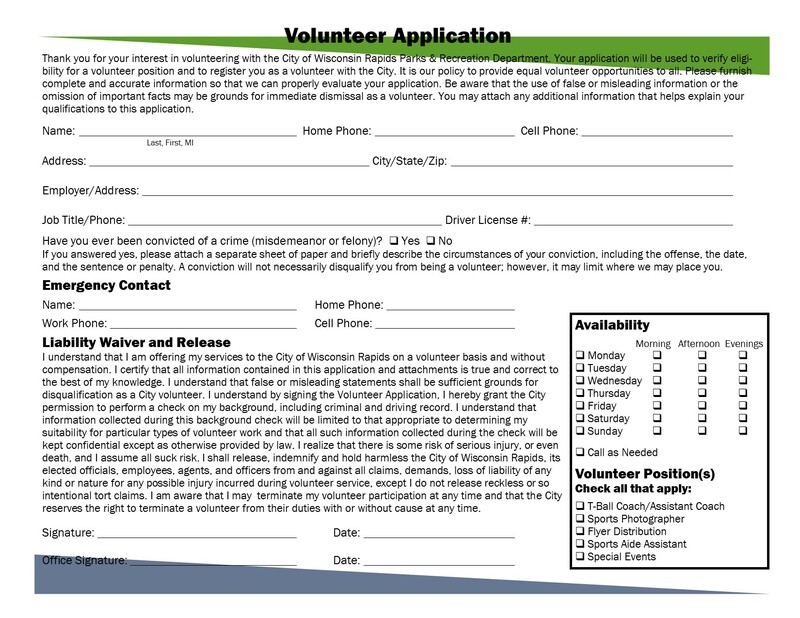 Volunteers are needed to help coach, distribute flyers, assist with sports and special events. You’ll have fun, make new friends, learn new skills and enrich the lives of your neighbors in the community. If you are interested in volunteering with the Recreation Department, please contact us at (715) 421-8240, or click HERE for our volunteer application.